Watch Recipe Video Above to see step by step directions. 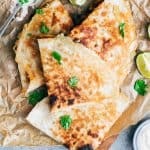 Crisp on the outside and juicy on the inside, these chicken fajita quesadillas are lunch box friendly, and even make a great party appetizer! The filling is chicken fajitas, mexican rice and cheese. Flipping them can be a little tricky without spilling out the filling so make sure to use my pro tip. Dice the chicken thighs into small pieces (between 1/4″ to 1/2″ in size) and add a teaspoon of oil, fajita seasoning, minced garlic and salt. Mix it up and marinate for 15 minutes. Once the chicken is marinated, heat a tablespoon of oil in a skillet and add the chicken. Cook the chicken for 5-7 minutes till its cooked through and slightly crispy on the outside. Add the onions and bell peppers and stir fry them on high heat with the chicken for another 2 minutes. To make the quesadillas, place a tortilla on a lightly oiled skillet. Place approximately 1/2 cup chicken filling on one half of the tortilla. Top this up with 2-3 tablespoons mexican rice and at least 1/4 cup grated cheese. Make sure the cheese covers all the filling. Flip the other half of the tortilla over the filling, press it down and cook the quesadilla till its golden brown from the bottom. Now take two spatulas and use one as support below the quesadilla to flip it (watch the video to see how I do this). Cook it on the other side for a few minutes till its golden brown. Cut them in half so that you have two triangles and serve them hot with sour cream. Chicken Thighs vs Breasts: I recommend chicken thighs because they don’t dry out and stay juicy. If you want to use chicken breasts, I recommend slicing them in half lengthwise, marinating them and then cooking them whole so that they retain their juices. Cook them for 4 minutes on each side (this can vary based on the size) and then chop them up.